This chapter is based on a talk presented to the Alpis Information Systems 2009 Annual Conference Carisolo, Italy. It examines the role of phenomenology, most importantly Heidegger’s notion of Befindlichkeit, in social situations. In discussing the meaning of “situated,” the chapter covers the importance of in situ studies, the problems with over-conceptualizing and the limits of Conoscenza Teoretica, Befindlichkeit, itself, and the limits of formal analysis. 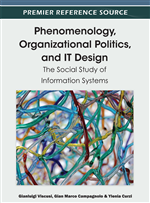 References to phenomenology are often made, but never quite fully explored and exploited. Collateral aspects are mentioned, such transparency, ready-to-handedness, and so on. Yet nobody quotes Section 29 of Being and Time, where Heidegger (1962, pp. 172 – 182) introduces the notion of situatedness (Befinlichkeit), contrasting it with the privileged role attributed then (and now) to understanding, cognition, and the purely mental. … Lack of proper references to phenomenology while using its ascendance may also induce the reader not versed in philosophy to believe that what these authors say about situatedness is indeed all that phenomenology has had to say on the subject. So I considered; if they want to know more about phenomenology and one of their founding thinkers has recommended reading Section 29 of Heidegger’s Being and Time, then instead of offering more talk about phenomenology, our meeting could be an occasion for reading some phenomenology, and I could think of no better selection from Heidegger than the Section 29 cited by Ciborra. Ciborra’s paper “Getting to the Heart of the Situation,” could be re-titled, “How did Befindlichkeit come to be ‘Situated,’ and what has it lost along the way?” Ciborra complains about what the Americans, like Suchman, do with Heidegger when they undertake “situated studies.” I have some sympathy with Ciborra’s lament here. As a social phenomenologist, I can say that I have spent much of the past four decades wincing whenever I heard or read sociologists, anthropologists, linguists, etc. use the term “phenomenological.” During this time, the thin, shallow use of the term “phenomenology” is probably the principal reason I have rejected the manuscripts that I review for various journals and publishers. What is the big deal about in situ studies? The problem with over-conceptualizing, and the limits of Conoscenza Teoretica. How can something so subjective have had so much influence? For the significant reason that the way that most of our models represent the world is deeply flawed. This includes not only our models as analysts but also the lay models that ordinary people and professionals alike employ in their everyday life. Our lives are lived subjectively, and our models do not account for the way we actually live our lives. They idealize matters, and the real work is made invisible; worse, the real work is obscured by the aggressive employment of our most cogent models. Worse still, the more cogent the models are made, the more obscuring they do. The actual social medium of our ordinary work of organizing local situations is rarely visible to the analyst, or to the practitioners, in just the way that water is unnoticed by the fish who swim in a stream. One of the reasons is that the influence of the Enlightenment survives today in the form of a compulsion to make things out to be more definite and certain than they really are, and here even the realists are lost within an idealism.